Amazon is poised to disrupt yet another industry. At the meeting, Sonde Health presented its technology: AI that can diagnose mental and physical conditions based on recordings of a patient’s voice. Rich Mahoney, head of clothing startup Seismic, demonstrated his company’s “powered” garments, which could help the elderly and disabled people cope with mobility issue. And neuroscientist David Eagleman showed off his company’s vest that uses “sensory substitution” to help the deaf communicate. It’s still anyone’s guess how these technologies could tie in with Amazon’s healthcare plans. 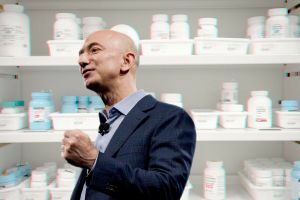 But it’s worth noting this was the first year Bezos invited reporters to join in on his “summer camp for geeks.” For someone who typically likes to keep Amazon’s future plans under wraps and carefully controlled, that fact alone could be a sign the company’s healthcare ambitions won’t be a secret much longer.